There’s something new for this year’s War and Peace Revival! 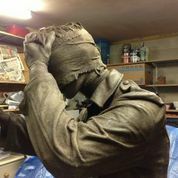 Exploring the art world, there will be a display of ‘full-height’ statues depicting soldiers and civilians from the war time period. The organisers of The War and Peace Revival are delighted to be able to show off this incredible collection of sculptures, created by professional artist Johanna Domke-Guyot at Folkestone Racecourse between the 16th – 20th July at the greatest military show on earth. These unique statues will be placed in the WW1 Experience Marquee, one such display depicting a line of gassed soldiers, hand on each other’s shoulders with eyes bandaged at full-height. There will also be sculptures of a civilian couple sitting in the Spitfire tea room. The statues are made using real clothing which Johanna adapts using a technique she’s created in a fondue cement. Johanna (who has a B.A in fine art with first class Honours and a Masters in Art & Design, Advanced Practice & Theories Merit) has worked as a professional artist for the past ten years, both as a teacher and as a student at Derby University. She has exhibited her work at Derby and many other prestigious galleries around the East Midlands and has given students and the general public talks on her art. Johanna is considered as a contemporary artist and sculptor and her work reflects everyday life and her own personal feelings and emotions.